Let me give you a story pitch: kids enter a contest, the winners are rounded up at a chocolate factory, after licking some walls they begin to get taken away one by one during the "tour", eventually only one is left to face the angry, strange factory owner in his even stranger office, and finally the protagonist is shot into space after being told he won some kind of contest he didn't know he was in. Horror movie plot? Nope, Willy Wonka and the Chocolate Factory. My brother and I discussed some creepy, supposedly kid movies on our podcast, but Willy Wonka and the Chocolate Factory just gets worse and worse in my head. What happens to those kids who start dropping like flies? Is this a soylent green is people situation? Is this the origin story? Is that tunnel during the tour necessary at all? Why are there so many leering adults? I have a theory, I have no evidence or facts or any nonsense like that, but I'm fairly certain this movie started out as a horror film. A horror film that involved children being turned into chocolate and Oompa Loompas being...well they are kind of creepy by default. I think it's the eyebrows. But that's just it, this movie already has plenty of the disturbing vibes going for it, and it's supposed to be this nice little kids movie about obeying the rules or some crap. You better obey those rules because that next batch of chocolate still needs Wonka's secret ingredient! The best evidence is in front of our faces the entire time: Gene Wilder. Don't let his comical, off the cuff, wonderfulness catch you off guard; he totally thought he was shooting a horror movie. First of all, he is odd right up front. He comes out of the factory as kids and parents are waiting for their tour, making everyone wait, all to pretend he is injured? Or something? But no, he can do a basic gymnastic floor routine, just kidding! Haha? Don't worry, he invites everyone inside and they are licking the walls in no time. Almost immediately, one kid gets sucked right on up the chocolate tube. Wow, phrasing. It's a direct line to the candy making. Wonka assures us, since the kid survived the tube, he will be fine. Let's face it; the Oompa Loompa songs are the distraction Wonka needs to disorient everyone just enough to keep the kids for his chocolate-making needs. Then there's the famous tunnel scene. Look me in the eyes and tell me that Gene Wilder didn't think he was filming a horror movie, come on! Then look into his eyes. Long story short, literally, almost all of the other kids start getting carted off to God knows where because they can't follow some fairly basic rules. I assume the parents are then taken away, and Wonka justifies killing them too because they are pretty horrible parents. They probably make the less popular candy or something. Even Charlie has to narrowly avoid his doom, and there would have been some fun clean up for the Oompa Loompas if he didn't belch his way out of that one. Finally, Charlie and his grandpa face the ominous Wonka in his office where every decoration is cut in half. Is he only half a person? Only half telling the truth? What's the symbolism here?! This is the critical moment, where Wonka seems so angry, the facade being torn down. Gene Wilder absolutely must have been thinking that this was finally the scene where all the insanity would come out. His character would be forcing Charlie onto some elevator that blasted off out into space (maybe), and Wonka would probably turn into some kind of toffee monster that could take the shape of whatever it wanted. Imagine Gene Wilder's surprise when they told him that he would just be leaving his factory for Charlie and his family to own, the end. Happily ever after huh? Here's the ending we were supposed to get. Sure, Wonka offers Charlie the factory after revealing to him that children are the key ingredient to Wonka chocolate. Horrified, naturally, Charlie and his grandpa do battle with the toffee monster Wonka. 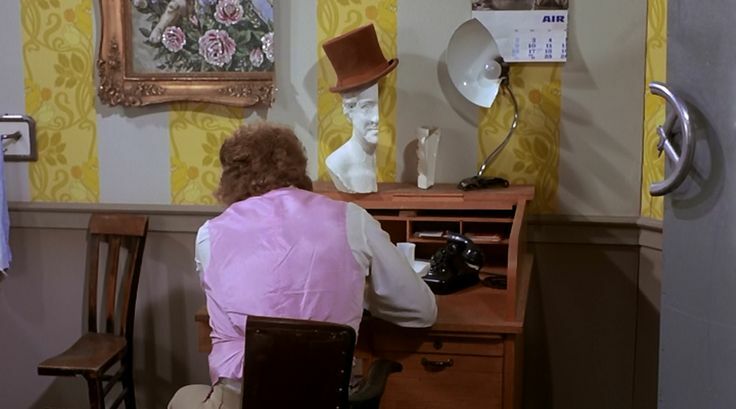 After Charlie stabs the monstrosity with the half clock off the wall, they pick up the papers Wonka had on his desk revealing the deed has already been put in Charlie's name. Charlie then remakes the factory and the brand into his own image, getting rid of the secret ingredient. The new taglines on each advertisement say “Chocolate that's kid approved!” He also sets all the Oompa Loompas free so that the paper trail of their racist origin is completely cleaned up. But not everything is all that great. Charlie begins losing out to his competitors because there's something lacking in the Wonka candy these days. The factory is nearly lost to bank loans and creditors, all while Charlie has to fire employee after employee in the already impoverished neighborhood. He opens up tours again, hoping that some of the magic will return but, tragically, a child falls into that damn chocolate river. (It really needs some guard rails or something). Before anyone can stop the process, some chocolate is made and, my God, it's delicious. Up against a wall, Charlie decides he needs to return the secret ingredient, as he loses a little bit of his humanity talking to himself in his office. The real twist is Charlie always felt like there was a little voice leading him in this direction. Cut to what used to be a half manakin for the famous Wonka hat. It now sits as a full face. It looks like toffee Wonka has been half watching all along! Or maybe I'm just messed up, and it's a delightful story about candy with some spooky themes, perfect for the whole family every October.